It was an historic speech both inspiring and motivating us for a more caring society, for us to make the leap and change the whole system, not just a slow piecemeal approach tweaking a few economic levers to reduce the worst climate impacts but still leave the substantial racism and inequality inbuilt in the system. Though a feminist from a jewish cultural background, Klein urged us to read the Pope's latest encyclical, Laundato Si. Though Klein does not mention this, there has also been an Islamic declaration on Climate Change issued in August. Here is my storify which collates tweets from the 2,500 people present at the Sydney Opera House with people watching via live streaming and interacting via twitter. 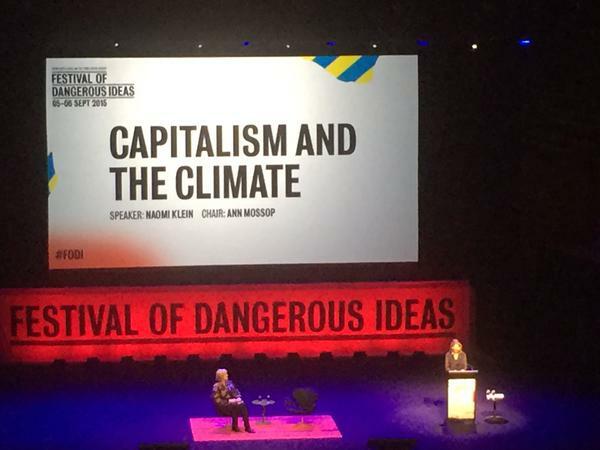 I also collated a storify on Naomi Klein at the Melbourne Writers Festival.